More from Ora: Is Jake Johnson The Inspiration For Drunk History? ‘New Girl’ star Lamorne Morris weighs in on the fate of the Fox series, his hilarious co-stars, and working with comedy great Adam Sandler. Plus, the funnyman opens up about his father’s past as a drug dealer, and his history with police. 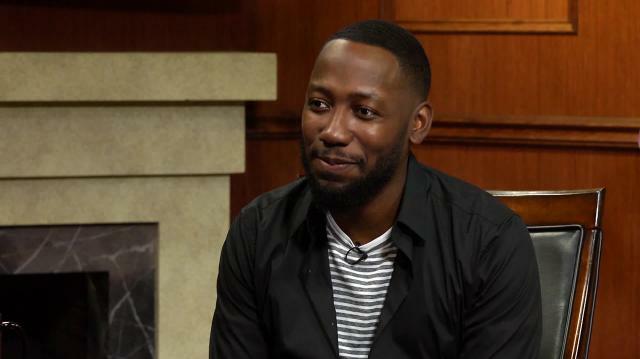 Larry talks to Lamorne Morris, an actor, writer, and host. Morris plays Winston Bishop on the Fox hit comedy ‘New Girl,’ currently in its sixth season, and stars in the upcoming Adam Sandler film ‘Sandy Wexler’ on Netflix. King asks Morris about playing Winston, whom King compares to Fonzie. Morris says it was originally a recast, and he began improvising to figure out who the character was, earning positive fan feedback. King asks how he got the part, and Morris says it took 15 auditions, including one where he was passed on since he wore very tight pants. The talk shifts from television to film when Larry asks Morris about his role in Adam Sandler’s new film ‘Sandy Wexler.’ Morris plays an antagonist named Bling, while Sandler portrays the titular ill-respected talent manager who discovers an amazing singer. King asks what it was like to work with Sandler, whom Morris praises as a naturally funny guy who works with a close group. King asks Morris about his natural comedic abilities, which Morris discovered when his dad called him the family clown, and he goofed off at church. Morris further developed his humor at Second City, an experience he calls one of the best times of his life. From past events, the conversation goes to current events. King asks Morris what it is like portraying a police officer on ‘New Girl’ in rough times. Morris mentions he wrote an episode, ‘Par 5’ based on his character’s perspective as a black citizen and officer. Morris believes the problem starts with school systems that need to be cleaned up, since without good afterschool programs, kids have free time to be on the streets. King asks if Morris has had problems with the police, and Morris recounts an incident where he, his Jewish girlfriend, and his friend were stopped by the police while walking to Morris’ car. Morris and his friend were handcuffed, while the officers asked his girlfriend if she was okay. “So how did you not turn out angry?” King asks. Morris says you channel your anger differently. While he doesn’t live in Chicago anymore, his family does, and he bought his mother a house in a better neighborhood. In closing, King asks for Morris’ thoughts on Trump, whom Morris describes as funny-looking.